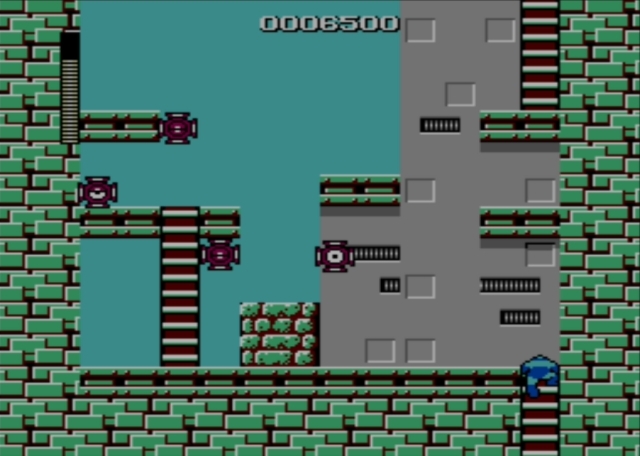 Here is another simple stage (compared to most of its peers, at least), with a boss you can again fell with your arm cannon if you so choose. That makes it another suitable starting point, but also a decent third stop on your tour. 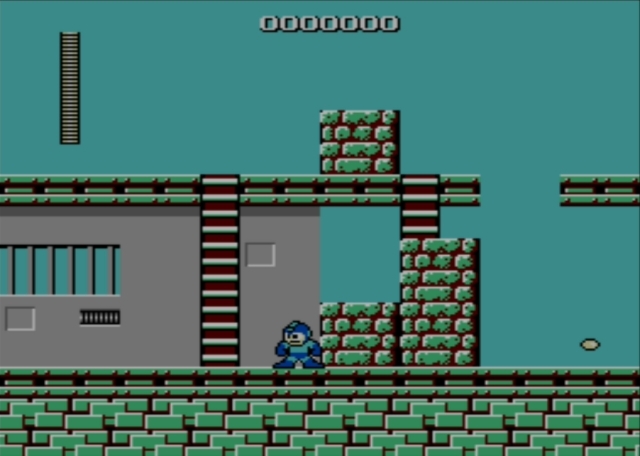 To your immediate left as you appear in this stage, there is a ladder. Drop from the block where you're standing and make your way to the ladder, which you can ascend to the overhead girder. Now follow that back toward the right, across a gap. 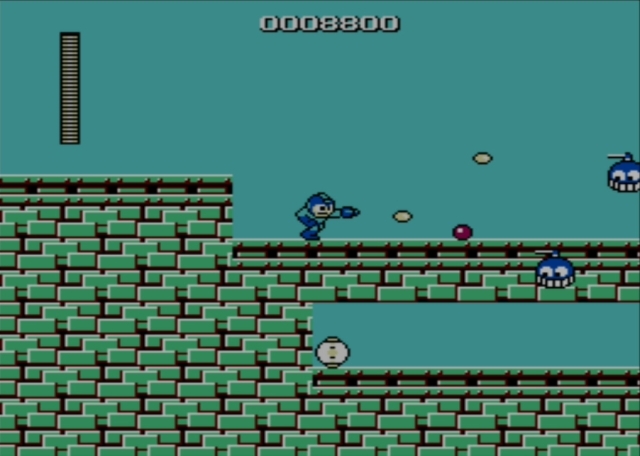 As you proceed in that direction, blue enemies fly toward you. If you've encountered them previously, you know they move in arcs as they get near you, an evasive action you should be prepared for and can counter by peppering them with bullets. There are quite a few of these enemies as you keep going, and some of them may drop helpful items as you go. Further to the right, you'll see shielded cannons positioned on some walls near ladders. The cannons fire three shots in a row, then disappear, only to return with three more shots. A single shot while their interiors are exposed (that is, while they're firing on you) will eliminate them. You can often tend to them from a safe-ish perch on a handy ladder. 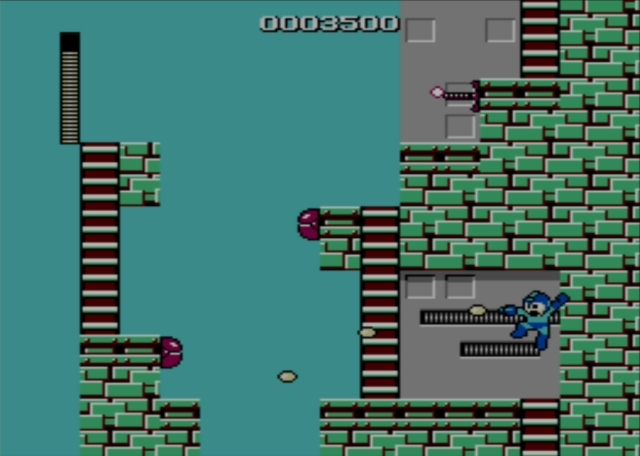 Climb into the next screen to encounter and eliminate more of the same red cannons. If you're careful here, it's easy to advance without taking damage, and you may even get lucky and cause items to drop that refill your meter in the event you were running low. Then you can ascend yet another screen. Defeat still more of the red cannons here, and climb up to the next screen. Would you be surprised to learn there are still more of the cannons? The one to your left as you first climb into the screen is the most dangerous, so shoot it while you're still on the ladder, before it has a chance to tend to you. Then climb carefully up the next two ladders, eliminating cannons at the halfway point to make that climb a bit safer. Here you will find what looks like a dispensing machine. Sure enough, C-shaped blades start springing out of the black opening as you push forward. Just keep moving and none of them should hit you. 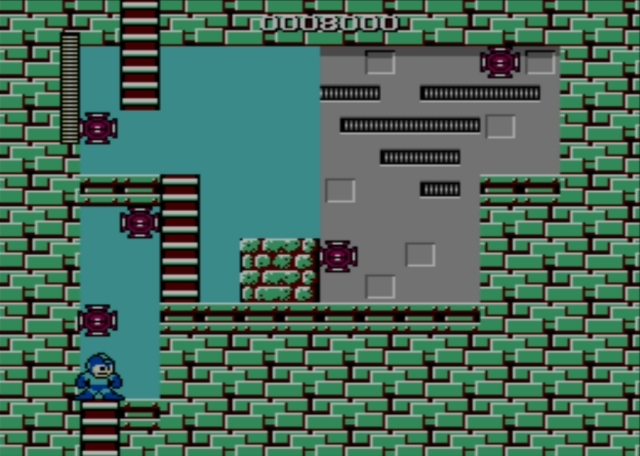 Next you'll encounter some fast-moving, blue spring enemies. Blast them as you ascend some step-like ledges. 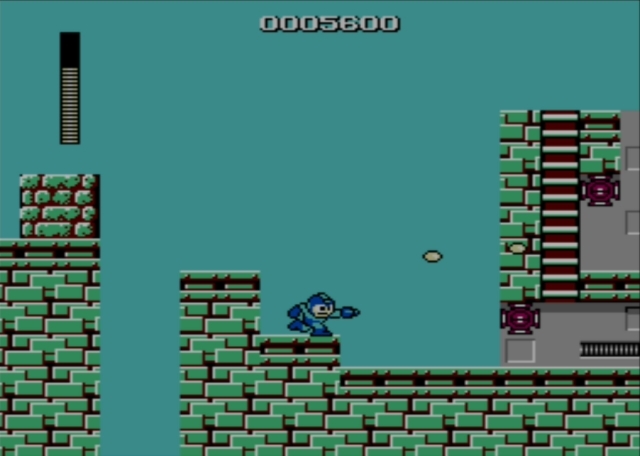 Advance further right from there and you'll find red suction enemies, like those you will have encountered near the end of Bomb Man's stage, if you cleared it before attempting this level. 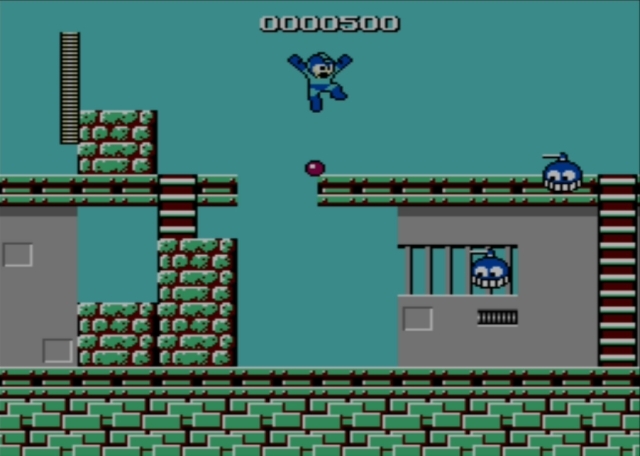 The first ones aren't positioned where they can do much harm, so you should be able to pick them off quite easily as you continue onward and climb the ladder into the next screen. Here, you find more of the same enemies. Give yourself a moment to watch their movements, if you need it, before advancing through the room and eliminating each foe from a safe vantage point. It's a good chance to stock up on energy, as needed. Then ascend once more. The main point of interest here--again--is a series of the red suction enemies. As before, you should be able to easily eliminate each of them without taking damage, particularly if you take things slowly. Then you can climb into the next screen. The enemies here are just more of the same. Before you move anywhere, though, stand still and let one of the fellows not quite directly above you descend to your level, where you can blast him. Then you'll want to jump upward when the path is clear and blast the other nearby guy. A methodic approach to this room should allow you to get through without any new scars. In the next screen, there's another dispenser. Run past it, as you did the previous one. 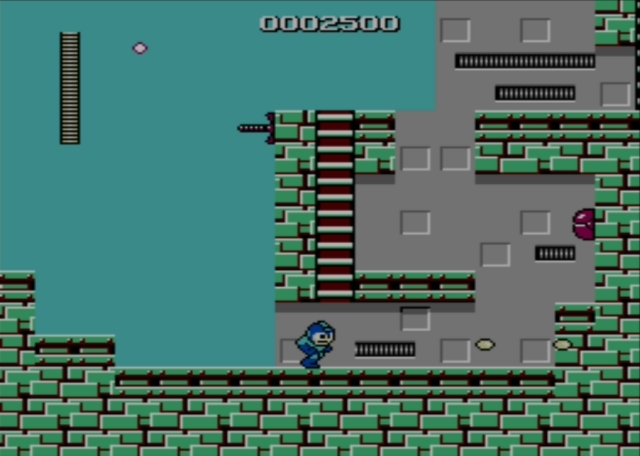 Ascend some steps and press onward, blasting more flying blue enemies out of the sky as needed. There is an energy capsule here, if you want it. Otherwise, just descend to the next screen and avoid spread shots fired by a flying orange pod. 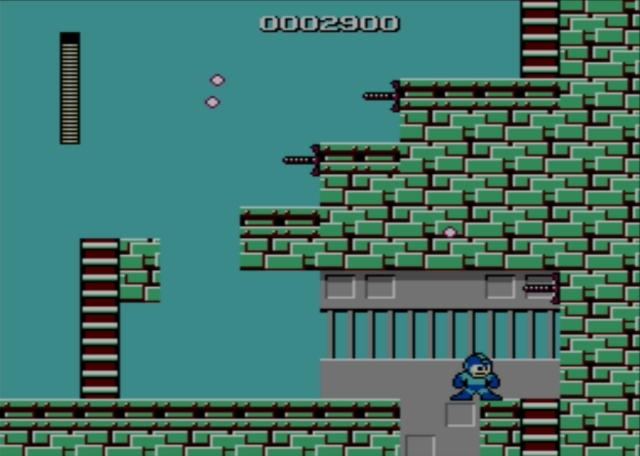 Descend the ladder to the next screen and there's another pod that will try to knock you into some spikes. 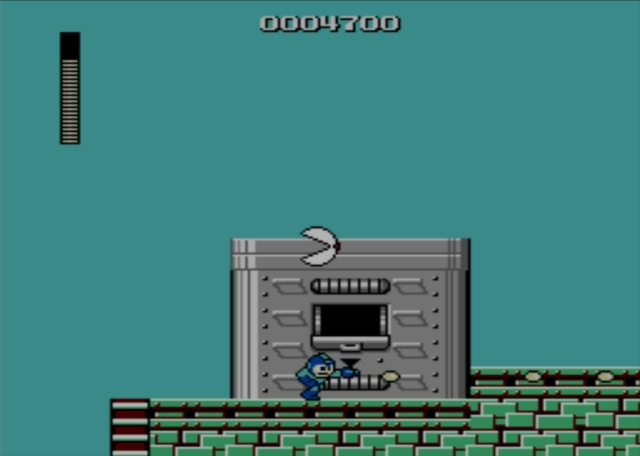 There's no reason to worry, though, because the spikes are toward the right and the ladders you need to descend are along the screen's left side. You would practically have to try to mess up there. In the next screen, it's a little easier to run into trouble. 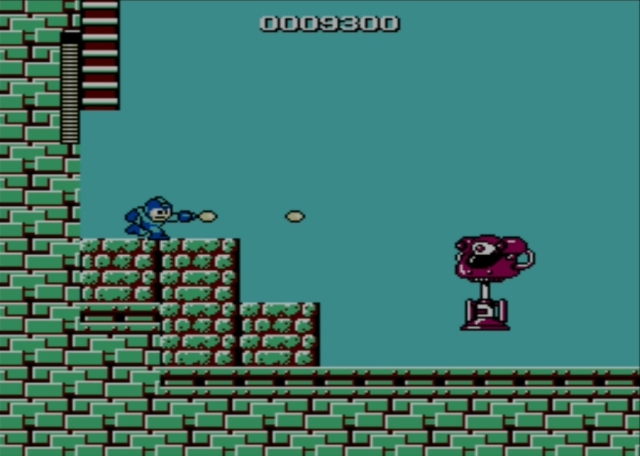 Another of the heavily armored, spring enemies that look like they're riding a toilet plunger will approach. As before, you're probably best running under it when it makes a large leap, though just when it will do so is difficult to ascertain. An ice shot can make things simpler, if you're thus equipped. Past that guardian, you'll find a double gate leading to a narrow hall. Head along it, defeating the orange enemies that pop out like sprinklers to fire spread shots. Then, past a few of those fellows, you'll find the gate leading to the area boss. In theory, you should use your Guts ability when facing off against Cut Man, so you can chuck huge blocks at him and make quick work of his life meter. However, keep in mind that he moves very quickly and may evade such efforts. If you're stuck using your arm cannon, that may actually work better. 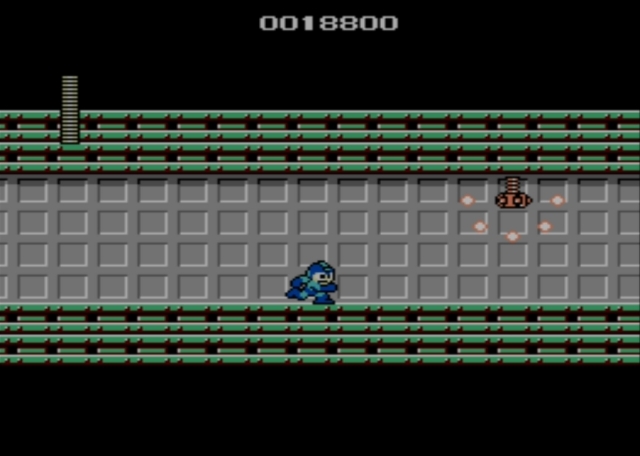 As you first appear, you can run toward the right along the chamber's two large blocks. Cut Man likes to toss the shears he wears on his head, and they travel out like a boomerang that is fairly easy to avoid both coming and going. 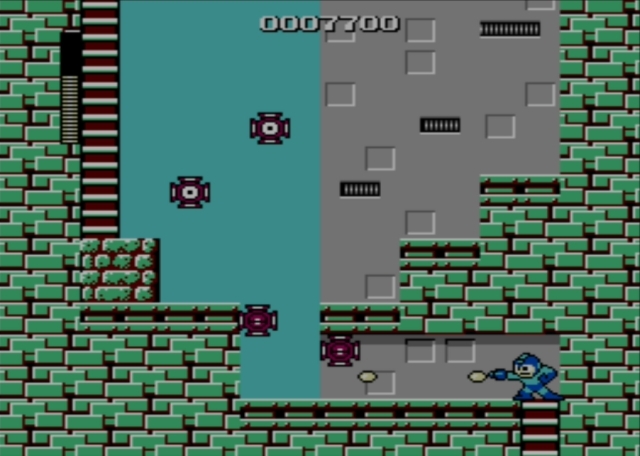 What you want to do is switch positions with him, so you're standing near the right wall facing left and firing shots at Cut Man. 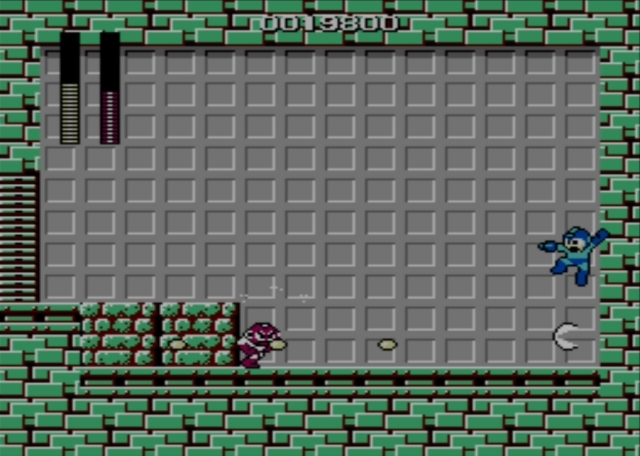 He'll keep tossing his boomerang, but it often will fly just to the edge of the screen and then return. This makes leaping over it quite easy, and in the meantime you can hit your foe with a flurry of shots that make relatively short work of his life meter. It's an easy battle, if things go as planned.